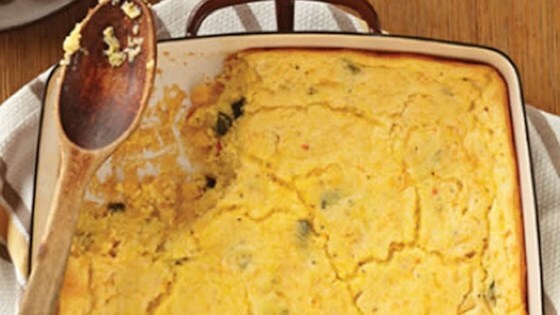 "Fresh poblano chiles, shredded cheese, and spicy southwest-style corn make an easy and delicious spoon bread." Preheat oven to 350 degrees F. Melt the 1 teaspoon butter over medium heat in a small skillet. Cook poblano chile pepper in hot butter for 4 to 5 minutes or until tender. Set aside. Combine water and cornmeal in a medium saucepan. Bring to boiling over medium-high heat; reduce heat. Cook, stirring constantly, for 1 minute or until very thick. Remove from heat. Transfer cornmeal mixture to a large bowl. Stir in cheese, sour cream, 1/4 cup melted butter, the salt and black pepper. Whisk milk, egg yolks and baking powder in a medium bowl until combined. Stir into cornmeal mixture. Stir in canned seasoned corn and the reserved poblano chile pepper. Beat egg whites with a whisk or electric mixer in a medium bowl until stiff peaks form. Fold beaten egg whites into cornmeal mixture. Pour into a greased 3-quart rectangular baking dish or 3-quart round casserole dish. Bake for 35 minutes for rectangular dish or 50 minutes for round dish or until a knife inserted near the center comes out clean. Let stand for 15 minutes before serving (bread will sink during standing). Excellent, plan to make it for family dinners again.